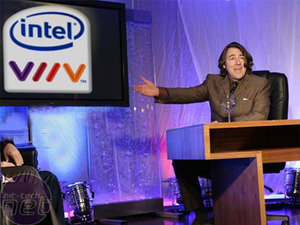 A couple of weeks ago, Intel held the launch party for its latest technology: Viiv. If you're not already familiar with Intel's newest platform, Viiv is the combination of dual-core Intel processors, networking and motherboard technology combined with some special software sauce to form a new breed of living room PC We went along to the party to have a chat and see what was going on. 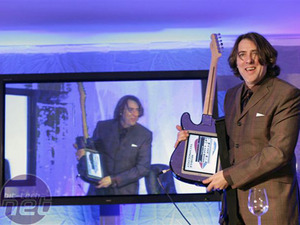 Jonathan Ross was on hand to give party-goers a light-hearted introduction to the technology. 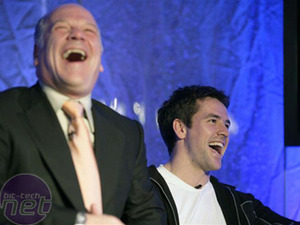 He bounced jokes off special guests in a live stage version of his popular Friday night show on BBC1. Appearing with Ross were football superstar Michael Owen, pundit Andy Gray and New Order bassist, Peter Hook. All are big fans of technology, and we rather suspect that all had been plied with freebie Viiv boxes from Intel. "They told me, 'There's a movie service, and you can log in, and you'll be able to watch movies on your TV at the same time as they're in the cinema!' I said to them, well, as the presenter of Film 2006, I get to watch all the latest films before they actually get to the cinema, so I'm not that bothered. So then they said, 'Well, you'll be able to download the latest music from top bands, and there will be live broadcasts of concerts from all round the world, so you'll be able to get the best concert tickets without ever having to leave your house!' Well, I said, as one of Radio 2's top DJs I get flown around the world to the best concerts and get put up in the best hotels with the best tickets at the gig, so that's not much use to me either. Then it finally occurred to me: Viiv isn't about entertainment. It's about giving normal people an idea of what it's like to be me!" 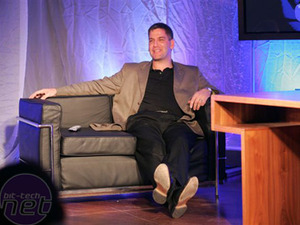 (left) Intel's Viiv supremo, Don MacDonald. (right) Jonathan Ross weilding Intel's Centrino Guitar. After entertaining the crowd by forcing Michael Owen to admit that the last gadget he had actually paid for was his helicopter - he gets all his other toys provided free by manufacturers wanting to be associated with him - Ross went on to talk to Viiv supremo Don MacDonald. Don is the Intel marketing guy who masterminded the success of the Centrino brand, and who is behind this new Viiv scheme. A few soft questions aside, Ross managed to outflank MacDonald when he was forced to admit that Viiv didn't work with Apple DRM'd iTunes downloads, which provided another moment of amusing Intel grimacing. With the pleasantries out of the way, we sat down with Don to talk a little more about Viiv and what it will mean for enthusiasts like us. Hauppauge has launched its HD PVR Gaming Edition box, allowing to you record your gameplay in HD.